It takes many steps and many hands to serve a great cup of coffee. Beginning in the coffee growing regions near the equator, where favorable climatic conditions produce a gourmet bean from the fruit of a very particular type of evergreen tree. Coffee comes from either a Coffea Arabica (Arabica) or Coffea Canephora (Robusta) plant. High-grown Arabica coffee which is the plant from which Black Diamond Coffee is derived is more delicate requiring higher elevations, cooler subtropical conditions, a liberal amount of moisture and plenty of sunshine. The secret to exquisite coffee flavor, that day-to-day, year-to-year consistency is a fresh hand-picked, quality-grown harvest and careful blending from crop to crop. We became the favorite morning coffee of Long Island, Brooklyn and Queens before the national chains dictated taste specifications from headquarters in faraway parts of the country. Our coffee has always been blended for the special preferences of our New York neighborhoods! Real NY coffee, every time! Stand up for your tastes! Get that genuine New York Coffee taste in your cup, at better independent food stores and restaurants throughout the NY/LI area. Our buying experience assures the best coffee beans. We’re small enough to be particular, large enough to be demanding! What made Black Diamond Coffee a New York favorite? We pay particular attention to the taste preferences of our New York customers, while sticking to the strict quality standards we set for ourselves from the very beginning. We start with the highest quality hand-picked, fully ripe coffee beans then, make sure every step in the process follows our protocols. Although a particular coffee harvest may provide a great bean, preserving that “greatness" is a function of care and quality throughout each step from tree to cup! Every cup of our coffee can be counted upon to provide consistently better flavor - We don’t make a “great coffee” claim unless it really is! The areas where coffee is grown stretch for hundreds of miles across the mountains of Central and South America, and run through many other equatorial regions of the world. The varying geographical and climatic features of the different mountain areas, the jungles, tropical rain forests, and the Seas all influence the vast coffee growing regions of the world. Regional growing, care and harvesting traditions throughout thousands of small plantations presents a diversity of products from which specific characteristics can be expected. The select high-grown coffee found in every package of Black Diamond Coffee is the finest available in the world. This product is a blend of coffee beans produced by a small number of dedicated farming families. Their mountainside farms, built on rich volcanic soil average 8 acres or less, and most reside at altitudes of 5000 to 6500 ft. above sea level. Relying solely on old production methods crops at this altitude depend on rain for irrigation, they are cared for and harvested virtually by hand. 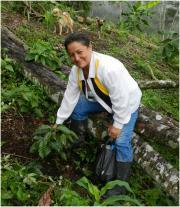 Coffee plants must be nurtured and protected for more than 4 years before they bear their first fruit. It takes about 2000 coffee “cherries” to produce 1 pound of coffee. Since cherries ripen on the same tree at different rates, the workers laboriously return to the same tree an average of eight times, before all its beans are harvested. What we commonly call the bean is actually a seed. The natural blooming cycle produces a flower within which is found the red or purple fruit called the cherry. It is the pit within the cherry that we refer to as the bean. These Select Specialty Coffees are diligently de-pulped, washed and carefully dried by the hard working farm workers. Only the seeds of the cherries remain, which are the actual green, unroasted coffee beans. They are then hand sorted to guarantee consistency in the roast. The exceptional attributes of these fine specialty coffees are apparent in both the appearance of the bean, and the taste of the brew. It gives us great pride to have them bear our name. The biological and physical properties of green coffee beans are transformed in the roasting process. 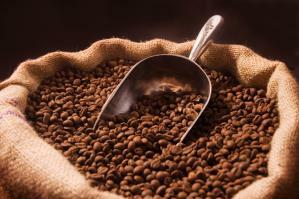 Coffee beans are commercially roasted for anywhere from 3 to 30 minutes producing light and dark beans. 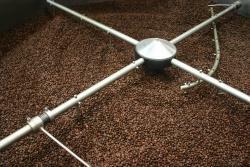 Commonly used drum or hot-air roasters produce temperatures ranging from 450 to 525°F. A good Roastmaster will follow a roasting profile to attain certain highlights from the bean varietal by concentrating on the internal bean temperature, and length and method employed in the roasting & cooling cycle. 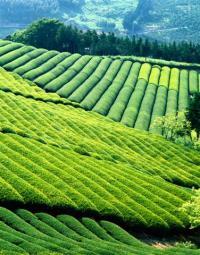 For freshness it is essential that coffee is roasted where the time to consumption is shortest. All of our blended coffees are blended after roasting. 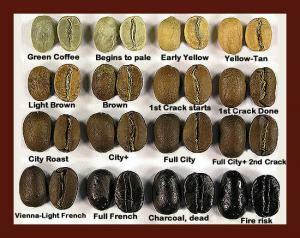 This is done to insure that each varietal can be roasted to the peak of its attributes. As coffee varies from one farm to the next, each crop has specific qualities that are detected and adjusted by our testers. Consistent coffee taste over the long term is assured by the skills of the blending team. Expediency and proper packaging is essential to optimize the flavor of roasted coffee beans. Prior to grinding, coffee shelf life should be measured in just weeks. 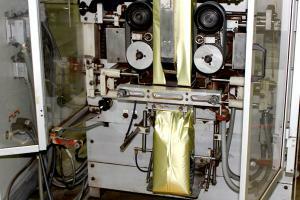 Packaging and storage in air tight canisters or foil-lined bags devoid of oxygen in a cool, dry location is best. Fresh beans, direct from our roasters are packaged immediately while still hot in high quality air tight packages. These special bags feature one-way valves to let gases escape while preventing oxygen from getting in. This assures our New York area customers of the freshest coffee shipments each day from our Long Island distribution center. To assure great ta sting coffee the grinding or milling of the coffee bean must coincide with the roasting and anticipated brewing method. Grinding to a degree of fine to course is selected based on brew cycle time. We are careful to avoid frictional heat from an “aggressive” grinding system that can prematurely release the coffee’s oils that would otherwise be extracted in the brewing process when the coffee is infused with hot water. The act of combining ground coffee with heated water releases the flavor from the core acids and proteins of the coffee bean. A simple rule of thumb is to use a coarse grind for longer brewing cycles and a finer grind for faster brew cycles. Although coffee can be boiled, steeped, drip-brewed or pressure brewed; for North American tastes, the drip method provides the most efficient use of the product while yielding a great tasting cup of coffee. You can’t make a superior cup of coffee without fresh water. Believe it or not the freshest water is found in an active, local retail environment where high traffic throughout the day assures rapid turnover of water. Even running the faucet at home for a few minutes will not result in the same effect as water that spends little time sitting stagnant in pipes. 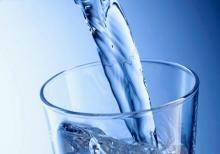 You cannot make FRESH coffee with STALE water! 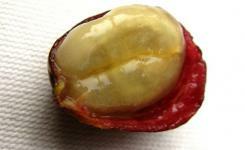 The unground coffee bean will protect its flavor for several weeks if properly packaged. Ground coffee deteriorates faster since more of it is exposed to oxygen in the air, & keeping it from exposure to oxygen is imperative. 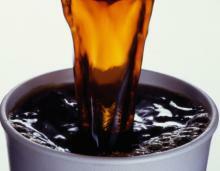 Once brewed, coffee that sits too long will turn more acidic as the surface area of the coffee is exposed to the air. When not consumed, (depending on holding method) coffee service guidelines suggest disposing of the beverage in as little as 30 minutes after it is brewed.